I really do love Meyer Lemons. With 3 fish-loving Norwegians in the house, we eat fish 1-2x a week and I'm always looking for tasty ways to serve it up. The Wall Street Journal featured a delicious looking recipe for Halibut with Meyer Lemon Mojo Verde this past week that didn't disappoint. 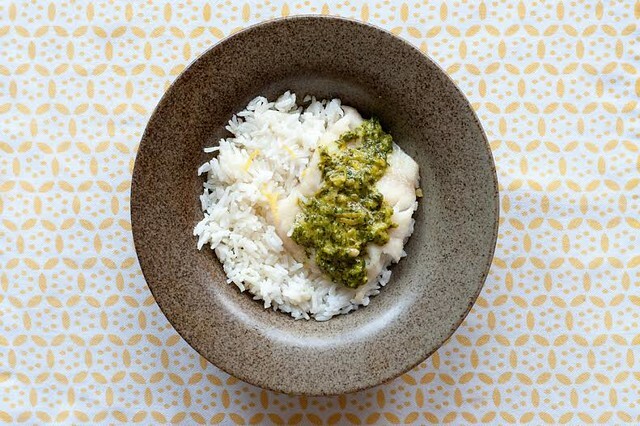 I substituted the Halibit with fresh Alaska cod for a simple week-night dish, serving it with roasted asparagus and our beloved coconut rice. My family will be celebrating the 17th of May tomorrow - Norway's Constitution Day. The celebration is extra special this year as we mark 200 years of independence. Gratulerer med dagen! !